Definition: The rule of 72 is a mathematical way to estimate the number of years it will take for your money to double with compounding interest. In other words, it’s a simplified method to figure out how long your money has to be invested in order to double at a given interest rate. What is the Rule of 72 Used For? Investors often use this calculation when evaluating the difference between similar investments. They want to see their investments grow, so they can take the proceeds to invest in more opportunities in the future. Keep in mind that this doesn’t have to be Wall Street investors or brokers. Average Americans can use this method to estimate the amount of money they will have in a retirement account or how much their share in a mutual fund will be worth in five years. The rule 72 will calculate how long it takes to double your money in an investment. In other words, it’s a simplified, very limited future value calculator that will compute the value of your investment in the future. This formula is a great shortcut because the full-length investment equation for compounding interest is long and complicated. You can use this simple rule of thumb as a base estimate for investments. Here’s how it works. 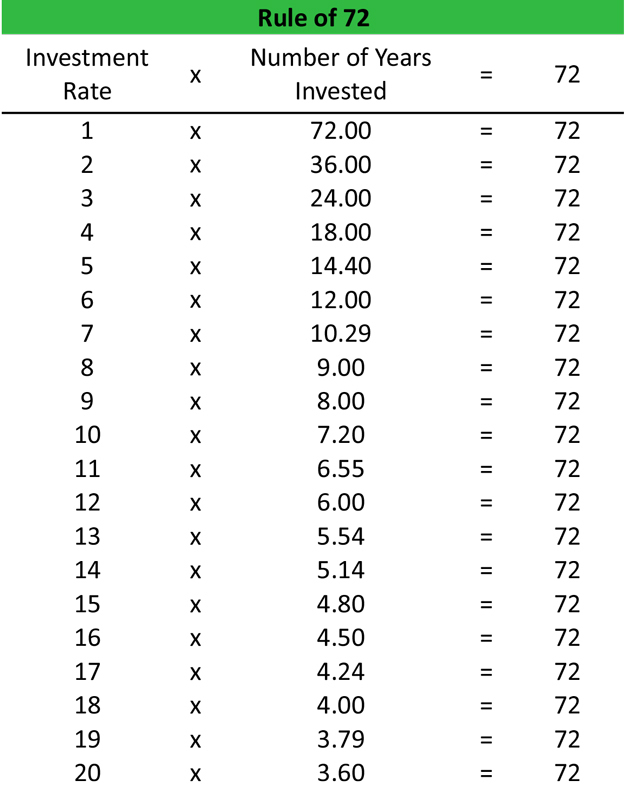 The rule of 72 formula is calculated by multiplying the investment interest rate by the number of years invested with the product always equal to 72. Applying a little bit of algebra we can rearrange the rule of 72 equation to calculate the number of years required to double your money with a given interest rate compounded annually. Or it can be written like this to calculate the annual compounded interest rate required to double your investment in a given time period. Keep in mind that the rule of 72 definition requires that the interest be compounded annually. This method will not work for investments with semi-annual or quarterly compounded interest as is. If you want to use this method for investment returns like that, you will need to modify it. Here’s an example table of the way a rule of 72 calculator works. As you can see, the first column represents the annual rate of investment that will be compounded at the end of every year. The second column shows the number of years it will take for the investment to double in value. The third column is always 72 because that’s how the formula works. The investment rate multiplied by the number years is always equal to seventy-two. Let’s assume you have $10,000 to invest in a mutual fund and you want to know how long it will take to become $20,000. You are positive that you can get an average return of 8 percent each year. Looking at our table above, we can see that it will take your investment about 9 years to reach the $20,000 goal. We can also do the reverse calculation. Let’s assume you have $10,000 and you want to know what annually compounded interest rate you will need to double your money in 5 years. Going back to our table, you can see it will require an interest rate of a little over 14 percent to meet your $20,000 goal in a 5-year span. How is the Rule of 72 Used? Obviously, we could have used the equation to calculate each of these examples, but I figured the table would be easier. We can also use a future value calculator or the actual future value formula to verify that these numbers are accurate, but we don’t have to. This method works. It’s a great shortcut because allows you to easily estimate the value of your investment into the future without the technical details of the actual future value equation. Depending on the interest rate, you can probably do the calculations in your head. One thing to keep in mind is that this method does not take into consideration other future factors that could derail your investment plans. For instance, inflation rates might change over the course of your investment’s life. You can however use the rule of 72 to calculate the effects of inflation on your money. For example, if the inflation rate went from 3 percent to 4 percent, your money will lose half of its value in 18 years instead of 24 years. You can even compare the rise of current costs like tuition and medical expenses with the rate of interest. This is pretty could. Test it out for yourself. You can use it for all kinds of interesting future value calculations. 1 What is the Rule of 72? 3.1 How is the Rule of 72 Used?